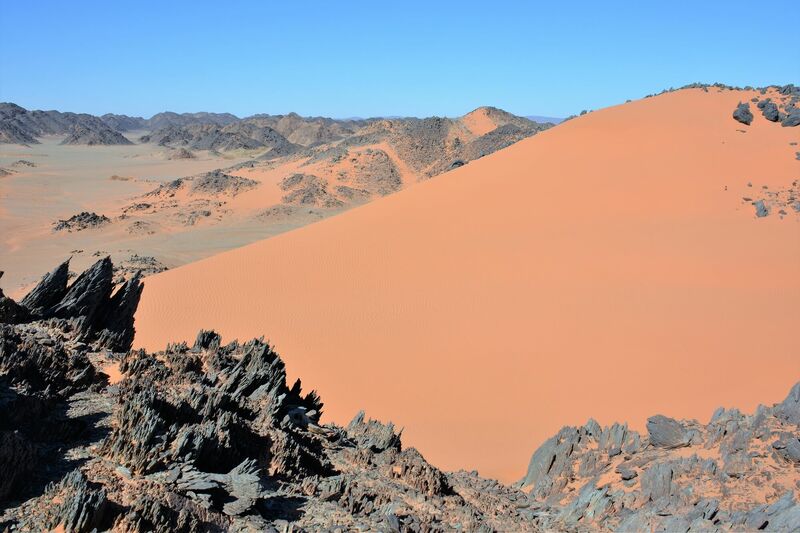 The Nubian Desert (Arabic: صحراء النوبة‎, Şaḩrā’ an Nūbyah) is in the eastern region of the Sahara Desert, spanning approximately 400,000 km² of northeastern Sudan and northern Eritrea, between the Nile and the Red Sea. The arid region is rugged and rocky and contains some dunes, it also contains many wadis that die out before reaching the Nile. The average annual rainfall in the Nubian Desert is less than 5 inches (130 mm). The native inhabitants of the area are the Nubians. The River Nile goes through most of its cataracts while traveling through the Nubian Desert. This is right before the Great Bend of the Nile. The Nubian Desert affected the civilization in ancient Egypt in many ways. Merchants and traders from ancient Egypt would travel over the Nubian Desert to buy gold, cloth, stone, food, and much more from the ancient civilization of Nubia.